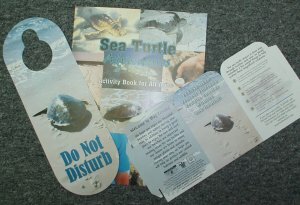 Summary: The educational program will produce and distribute the following print materials in Bay County: (1) Do Not Disturb door hanger and table tent for distribution to beachfront motels and condominiums, (2) sea turtle activity book for distribution to elementary schools and school-age beachgoers, (3) flier describing the new Bay County lighting ordinance for distribution to beachfront property owners in the affected area, and (4) informational sign. Additionally, the local community will be informed of sea turtle issues through a Public Service Announcement to be aired on local television stations. Results: All tasks have been successfully completed. With the help of Brad Smith a four fold lighting flier was designed and 200 mailed to beach front residence. The lighting flier was developed with the input of Lorna Patrick (USFWS), Kennard Watson (RMA Turtle Watch), Sandy MacPherson (USFWS), Brad Smith (FWCC) and Nancy Evou (NMFS). The flier states the disorientation problems that lights cause on nesting turtles and hatchlings and how to correct the problems. It was printed through Creative Printing in Panama City. For the table tents and door hangers 11 hotels and condos were selected. The selection was based on where the most nests had been laid on Panama City Beach. Table tents were also distributed to 13 beach restaurants.